Galena is a root chakra stone. Most protection stones are related in some way to the Root Chakra, since survival and security are root chakra issues. Most red and black stones, along with many brown and gray stones, are also related to the Root Chakra. Other crystals and stones may also be related to the Root / Base Chakra as well. One way to access the energy of a root chakra crystal is to hold it in your lap for several minutes. Ruby is a root chakra stone. 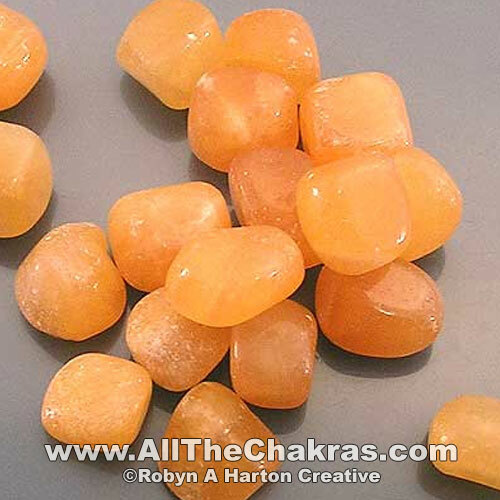 Orange calcite is a sacral chakra stone. Other stones may also be related to the Sacral Chakra as well. Lying down with a Sacral Chakra stone at your navel for several minutes is one good way to energize the chakra. Another method is to wear a sacral chakra stone in a navel piercing for those who have a navel piercing. Quantum-quattro-silica is a sacral chakra / spleen chakra stone.